Keeping noise levels in check and at safe levels is very important to ensure employee safety and well being. OSHA (the Occupational Safety and Health Administration) through standard 29 CFR-1910.95(a) has studied the situation and set Maximum Allowable Noise Exposure limits in Hours per Day based on the Sound Level, in dBA, of exposure. For existing processes, a Digital Sound Meter is a valuable tool to measure the sound level to ensure that the source of loud noises can be quickly identified and isolated for immediate corrective action. For new processes, or changes to an existing process, it is important to estimate the sound level prior to installation and start-up, so that precautions can be taken as needed. For example, let’s say we are going to add a blow off station to clean off a part on a conveyor to improve the process and increase the throughput. A typical set-up might be a 12″ Super Air Knife (model 110012) blowing off the top and a pair of Super Air Nozzles (model 1100) to blow off the sides. If we look at the performance data for the (2) different blow off devices, we find that the Super Air Knife is rated at 69 dBA and the nozzles at 74 dBA, when operated at 80 PSIG of compressed air supply. When asked, “what is the sound level for (1) of the knives, and (2) of the nozzles” a little Acoustic Engineering is in order. The decibel scale is logarithmic, and determining the total sound level when all (3) devices are in operation is not as easy as adding up the three sound level values (which would equal 218 dBA, way off the charts!). Thankfully, both the actual sound level and the numerical value are determined another way. I’ll spare you a lot of the math but the equation is as below. Plugging in the numbers into the equation, the combined sound level works out to be a quiet 77.65 dBA — well within the OSHA limit for exposure for a full 8 hour period. To discuss your application and how an EXAIR Intelligent Compressed Air Product can make your process better and quieter, feel free to contact EXAIR and myself or one of our other Application Engineers can help you determine the best solution. EXAIR offers the model 9104 Digital Sound Level Meter. It is an easy to use instrument for measuring and monitoring the sound level pressures in and around equipment and other manufacturing processes. Sound meters convert the movement of a thin membrane due to the pressure waves of sound into an electric signal that is processed and turned into a readable output, typically in dBA. The dBA scale is the weighted scale that most closely matches the human ear in terms of the sounds and frequencies that can be detected. To protect workers in the workplace from suffering hearing loss OSHA has set limits to the time of exposure based on the sound level. The information in the OSHA Standard 29 CFR – 1910.95(a) is summarized below. The Digital Sound Meter can be used to monitor and measure sound levels of manufacturing processed such as blowoffs for cooling or drying. Many blowoffs, especially open or drilled pipes are very inefficient and can be identified as a source of excessive noise, outside the OSHA exposure ranges. Once the noise violators are identified, a review can be done and the implementation of engineered solutions such as Super air Nozzles or Super Air Knives can be investigated. Keeping harmful noise levels in check benefits everyone involved. The EXAIR Digital Sound Level Meter is an accurate and responsive instrument that measures the decibel level of the sound and displays the result on the large optionally back-lit LCD display. There is an “F/S” option to provide measurement in either ‘slow’ or ‘fast’ modes for stable or quickly varying noises. The ‘Max Hold’ function will capture and hold the maximum sound level, and update if a louder sound occurs. Certification of accuracy and calibration traceable to NIST (National Institute of Standards and Technology) is included. 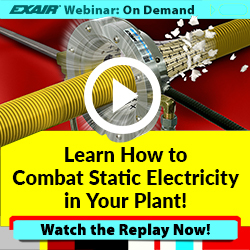 There is an informative Video Blog, presented by @EXAIR_LE that can be found here. If you have questions about the Digital Sound Level Meter, or would like to talk about any of the quiet EXAIR Intelligent Compressed Air® Products, feel free to contact EXAIR and myself or one of our Application Engineers can help you determine the best solution. EXAIR offers meters to measure the level of physical parameters such as sound and static. Each meter has sensitive electrical circuitry and a periodic calibration is recommended to ensure the meter readings are tried and true. The model 9104 Digital Sound Level Meter is an easy to use instrument that measures and monitors the sound level pressure in a wide variety of industrial environments. The source of loud noises can be quickly identified so that corrective measures can be taken to keep sound levels at or below OSHA maximum allowable exposure limits. The sound meter comes from the factory with an NIST (National Institute of Standards and Technology) certificate of accuracy and calibration. As a good practice, EXAIR recommends a yearly calibration of the instrument, and we offer a service that calibrates the unit to the same NIST standards and provide a written report of the calibration. The model 7905 Static Meter allows easy one-hand static measurements. It is useful in both locating sources of high static charge and checking the reduction of static after treatment with an EXAIR Static Elimination product. The unit is sensitive and responsive, and indicates the the surface polarity of objects up to +/- 20 kV when measured from 1″ away. It is also recommended that the Static Meter be calibrated on a yearly basis. EXAIR offers (3) levels of calibration service. The first two provide calibration in accordance with MIL Standards using accepted procedures and standards traceable to NIST. The third calibration service conforms to the same Mil Standard, as well as ISO/IEC standards. Annual calibration service of your EXAIR Digital Sound and Static Meter, along with proper care and storage, will keep your meter performing tried and true for many years, providing accurate and useful measurements. To initiate a calibration service, give us a call and an Application Engineer will issue an Returned Good number, and provide instructions on how to ship the meter to EXAIR. If you have questions regarding calibration services for your meters or would like to talk about any EXAIR Intelligent Compressed Air® Product, feel free to contact EXAIR and myself or one of our Application Engineers can help you determine the best solution. 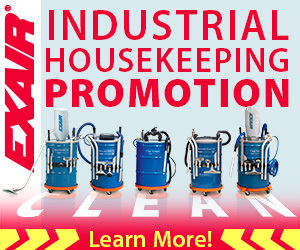 Last week, the EXAIR Blog featured an article about the OSHA Standard 1910.242(b) – Reduction of Air Pressure below 30 psi for Cleaning Purposes. This week, we will review another OSHA standard that affects many of you in manufacturing and other industries. From the chart, the time an employee can be exposed to loud noise is greatly reduced as the sound level goes up. The use of hearing protection is helpful but relies on the operator to use consistently and correctly. Ear plugs or ear muffs can be uncomfortable and hot, leading to possible reduced usage. OSHA can come on site, and if violations to the sound level exposure limits are found, they can impose fines and mandate corrective action be taken place. The recommended course of action when an operator is subjected to sound exceeding those in the chart above is to enable feasible administrative or engineering controls. Engineering controls is the arena in which EXAIR can be a great resource. The first step in understanding and addressing any sound level issues is to measure the sound. The easy to use Digital Sound Meter, model 9104 shown below, allows for accurate testing of noise levels throughout the facility. Noisy areas can be quickly identified, leading to review, design and implementation of the engineering controls. Some of the worst offenders for noise violations is compressed air usage. A prime example would be inefficient blowoffs, used for cooling, drying, or cleaning. Open pipe, copper tube or drilled pipe are a few of the common culprits. Not only do they consume excessive amounts of compressed air, they can produce noise levels above 100 dBA. EXAIR manufactures a wide variety of engineered products that utilize compressed air and deliver it in a controlled manner. This allows for the most efficient use of compressed air and keeps the sound levels much lower than the inefficient methods. A Super Air Knife can replace a drilled pipe, reducing sound by as much as 20 dBA, while using 50-70% less compressed air. An engineered Super Air Nozzle can replace an open pipe or copper tube and reduce sound levels down to 74 dBA, and even down to 58 dBA for the smallest available nozzles. EXAIR has been providing Intelligent Compressed Air Products since 1983. If you have questions regarding noise limits and how to solve any issue with an EXAIR Intelligent Compressed Air® Product, feel free to contact EXAIR and myself or one of our Application Engineers can help you determine the best solution.